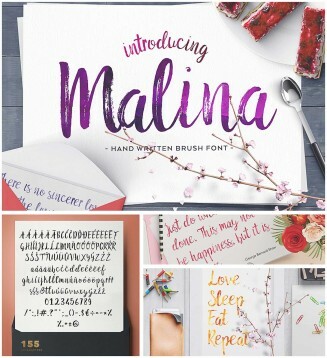 Introducing Malina brush font with multilingual support. Malina is perfect for restaurant menus, greeting cards, invitations, weddings and many more. File format: .otf, .ttf for Photoshop and other software. Tags: brush font, hand lettering, ink, multilingual, watercolor.